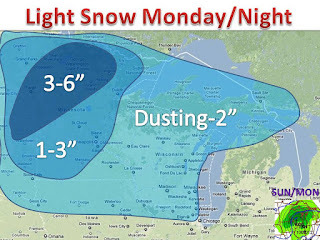 Light Snow will continue to spread over the Midwest today and tonight and accumulate in many areas. The system will weaken as it moves to the east so the heaviest totals will occur in the far northwest of the midwest. The system Thursday is looking less an less impressive, maybe an inch out of that one. But...the storm for next Sunday and Monday is looking stronger and is showing up in all the major computer models. If trends continue this could be our first major winter storm of the season, maybe 6-12"? But as this winter has been..this may be another model fantasy. Stay tuned!